I ate this yesterday!!! 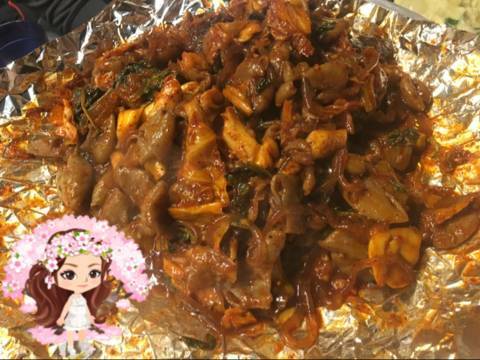 Is it Gopchang Bokkeum (Stir-fried Beef Tripe)? There are a few foods that I can’t it right~ but recently I feel satisfied that I’m starting to eat them one by one^^;; I even tried to eat sushi… Although not everything, I just started with salmon. And I also tried eating sundae (sausage) and tteokbokki (stir-fried rice cake) by dipping each one in the soup, and even ate gopchang in the same way and I think it was fine because I’ll eat noodles, vegetables, rice cake, and a lot more. I ate it all, even the rice and stir-fried dishes^.^ I’m 33 years old and I still don’t have a lot of new experiences.